An individual cannot grow without a support from the people around him and the same applies to me. As an author and a professional gemmologist, there have been a lot of people around me, which helped me to gain the learning and experience, to develop writing skills and to grow into a more proficient gemmologist. I would like to thank the following for all their help during all these years in every aspect of my life. First of all, my family - my parents who have always supported and encouraged me during my initial years in the subject and at the lab, then my wife, Riddhi, who has spent countless hours alone during my numerous assignments, be it research, publications, travels, etc including this website and, my younger brother, Lokesh who has been of great support for me, by taking care of other family responsibilities. Then, to Mrs. Shyamala Fernandes, who has been my mentor since the beginning of my gemmological career. She was the sole inspiration for me during my early days in the subject.... being my instructor and then my boss until 2003 at the Gem Testing Laboratory, had quite a tough time with her, but I now relish (miss too!) every moment remembering working with her. Thank you Ma'am! 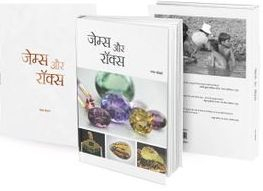 And, to (Late) Mr. Rashmikant Durlabhji who always encouraged and improved my writing skills and ways of judgment by providing concise projects on gemstones. To many editors of various publications I have worked with such as Ms. Alice Keller, Mr. Brendan Laurs, Mr. Tom Overton, Mr. Stuart Overlin, Mr. Justin Hunter, Ms. Jennifer-Lynn Archuleta, Mr. Duncan Pay, Ms. Mary Burland, Ms. Georgina Brown, Dr. Jack Ogden, Ms. Francine Payette, Mr. Terry Coldham and Mrs. Gwyn Green. Their continuous support and encouragement have made it possible for me to share some really interesting gemmological material with the world. Finally, the Jaipur Gem Trade, which has shown faith and belief in us (as a lab and as an individual), and getting in numerous unusual and interesting materials for study.